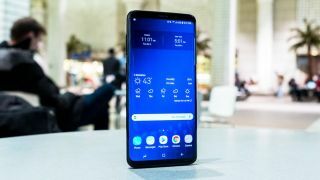 There's no shortage of Samsung S10 leaks now, but we might have just had our best look yet at the phone, along with the larger Samsung Galaxy S10 Plus, thanks to some high-quality leaked photos shared by AllAboutSamsung. Starting with the front, you can see the expected almost non-existent bezel above and below the screen, with a punch-hole camera in the top right. There's a single-lens one on the Samsung Galaxy S10 and a dual-lens one on the Galaxy S10 Plus. Flip the phones over and you'll note that both handsets have a triple-lens rear camera and a likely glass back. We also get a good look at the bottom edge, which on both phones houses a 3.5mm headphone port, a USB-C port and a speaker. There's no real information included with the photos, other than that the boot logo will probably be different at launch and the caveat that these are apparently prototype devices so could be subject to change, but they line up with other leaks and look convincing. We're also not surprised to see clear images of the phones this close to their February 20 announcement, so while we'd take these with a pinch of salt, we'd also say they're likely to be accurate.